Occasionally DJ Steve and I work up the courage to leave the comfortable glow of our computers and actually, you know, go outside. Turns out there’s an exciting and unpredictable world out there! 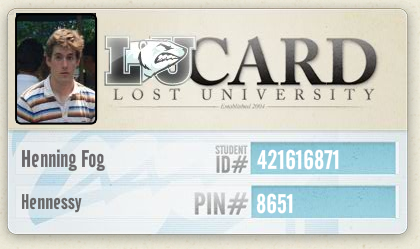 LIFTING FOG LIVE is where we catalog those real-world adventures and move from the realm of “I found this online” to “I did this for real.” Hold onto your butts. 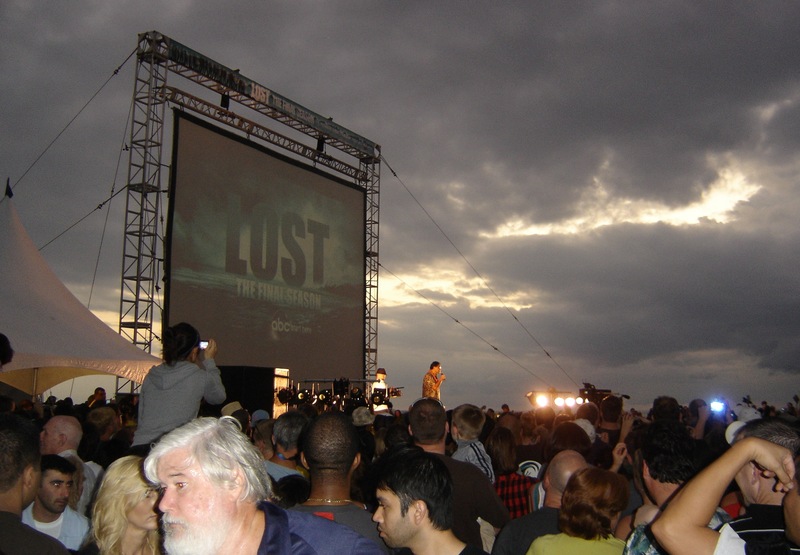 It was really something of a special DHARMA treat — and an amazing case of cosmic fate — that I was in Oahu, HI and on Waikiki Beach Saturday night for the world premiere of LOST‘s sixth and final season. The last one! No more! After five years of loyal viewing and a fruitless number of hours spent researching quantum physics, I was finally granted the chance to come face to face with the show’s cast and crew…and, of course, to watch the first hour of Tuesday’s season premiere. You say you haven’t seen it? I’m sorry! It’s all too appropriate that a show founded on dividing viewers keep the tradition alive as it nears the finish line. But forget the fact that I now know more than any of you about Kate hooking up with Locke, or Frogurt turning out to be the Smoke Monster. Saturday night wasn’t about lingering questions, BROTHER, but about celebrating a show that’s come to represent so much more than just a great mystery story. 10,000 NERDS, all nerdier than me, were in attendance at the event. An absolutely nuts amount of nerds (I’ve got the photos to prove it! ), and something that speaks less to a “great turnout” than it does a sense of community and shared cultural experience; a tie that, even though rooted in something fictional, means quite a bit to a great many people. You could feel and see and hear it on the red carpet hours before the sunset screening. Fans dressed as DHARMA members and polar bears were almost CRYING with the arrival of every new limo. “JIN! LOCKE!” they called out. Some actors were more difficult to identify (“…THE PILOT! THAT WOMAN!”). Some were misidentified completely, and with embarrassing results (“Miles’ mom!” “…Because I’m Asian? I’m a producer.”). It’s okay, you were just excited! Right or wrong, appropriate or borderline racist — it didn’t matter. The enthusiasm brought to the red carpet was really something to take in. God knows the sound of a thousand women screaming “SAAAAAWWWWWYYYYYEEEERRRR!!!!! !” (then fainting, hard) is one I won’t soon forget. After an introduction by the Mayor of Honolulu, Lost‘s intrepid showrunners Damon Lindelof and Carlton Cuse took the stage to graciously thank the fans, and particularly Oahuans, for making the show what it is today. I know these kinds of shout-outs are superficial. I know that the whole sunset screening was as much for publicity as it was giving back to the Lost community. But dammit if it didn’t feel REAL and altogether special. LOST premiered nearly six years ago on ABC to rapturous acclaim and a slew of immediate and rabid followers. Until the end of that first season, I was not one of them. “Why aren’t you watching, man? This is like TOTALLY your kind of show!” “One episode, dude. Seriously, just give it one episode and you’ll be hooked.” “I hate it when you refuse to watch something because a bunch of other people like it. THAT JUST MEANS IT’S GOOD.” And so on. Having seen no prior episodes and with nothing riding on my involvement either way, I sat down to watch the first season finale in May 2005…and realized that all of the above were true. It was TOTALLY my kind of show. Sad characters searching for redemption! Polar bears! Twenty minutes in, I couldn’t imagine missing another episode. And my conscious aversion to all things popular? It had only been stopping me from watching maybe the most captivating non-HBO series to have aired in my lifetime. LOST blew open my hatch-shaped heart and made a semi-permanent home inside. Through this sixth and final season — and at least until the DVD boxed set arrives in August — I remain a true and loyal fan. Namaste, Namaste. This entry was posted on February 1, 2010 at 8:58 am and is filed under "News", TV. You can follow any responses to this entry through the RSS 2.0 feed. You can leave a response, or trackback from your own site. Don’t use Rushmore lines on me, Steve. …And anyway Locke shops at the Foodland around the corner, so whatever.